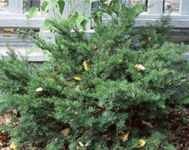 Large conifer shrub with an loose open growth habit. Long lived tree with spirally arranged leaves. Does best in warmer climates. Hardy to -10F (-23.3C); height: 60ft. Symmetrical broad conical shaped tree with a well defined central trunk. 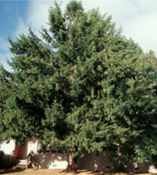 Faster growth than the English yew. Good type for hedges or borders, as it withstands shearing well. Hardy to -30F (-34.4C); height: 50ft.